Chef David Thompson of London is the highest-rated Thai food expert, and his restaurant, Nahm, holds the distinction of being the only Michelin starred Thai restaurant in Europe. 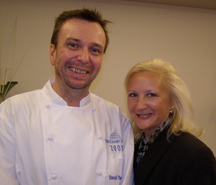 Luxury Experience Magazine had the opportunity to meet him at the 15th St. Moritz Gourmet Festival in Switzerland in January 2008 where he was one of the featured chefs. I was curious though, how an Australian who now lives in the United Kingdom, became a Thai food expert, and so I asked him, "Why Thai food?" He laughed and replied, "It is bewildering that I cook Thai food. I went to Thailand over 20 years ago and fell in love with the place. It is the most beguiling, bewitching, and delicious place." His fascination with Thailand continues, and he now spends about 6 months there each year where enjoys going to the market and tasting new things. As the owner of Nahm, which specializes in Thai cuisine, he brings Londoners a delicious taste of Thailand. Chef David Thompson graciously shares his recipe for Raw Salmon Salad (pla plaa salmon), which uses "scuds" as one of the ingredient. Rest assured, scuds are simply Thai Bird's Eye Chili Peppers, also called Chili padi, which are small and very hot. Method: Trim the salmon fillet and slice finely across. Combine the salt and the lime juice in a bowl, add the fish, and work to marinate; allow to stand for a few moments to "cure" it. The dressing should be equally sour and salty. Add the shallots, lemongrass, mint, and chilies. Toss to combine.